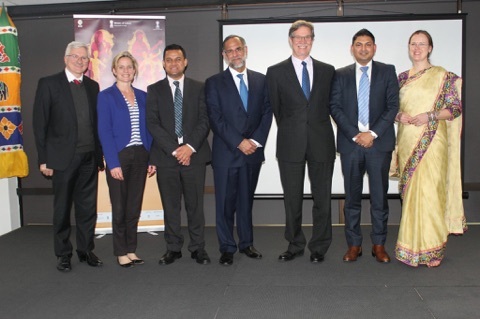 Pictured above at the media release for Borderless Gandhi and Confluence Festival, from the left: Director General Duncan Ord OAM, the Department of Culture and Arts; Executive Director Rebecca Ball, Office of Multicultural Interests; Mr. Amit Kumar Mishra, Consul General of India in Perth; Mr. Navdeep Suri, High Commissioner of India to Australia; Hon. Dr. Michael Nahan MLA, Treasurer, Minister for Energy, Citizenship and Multicultural Interests; Nilesh Makwana, Founder of Borderless Gandhi and Illuminance team member, and Lene Makwana. The Confluence Festival of India in Australia will soon come to life. First announced by Prime Minister Narendra Modi during his visit to Australia in November 2014, the festival will begin on 1 August. The event is designed to celebrate culture, while highlighting business opportunities between the two countries. The event comes in a time of need. Although Australia boasts a culture of multiculturalism and acceptance, on a worldwide scale there is tension and violence between races and ethnicities. Instead of adding fuel to the fire, Confluence will do the opposite. The Festival celebrates the coming together of two countries, and views the differences between them as opportunities. “From the Opera House in Sydney to Federation Square in Melbourne, from QPAC in Brisbane to the Festival Centre in Adelaide, from the Old Parliament in Canberra to the State Theatre in Perth, the Festival of India will enthrall audiences, foster collaborations between our artists and create cultural bonds like never before,” Commissioner Suri said. Illuminance is proud to share that Nilesh Makwana, one of our leadership team members, will be involved in the festival. Alongside his role at Illuminance, Nilesh is the founder of the Borderless Gandhi Project. The Project aims to promote peace, nonviolence and equality through artistic reflections of the life and legacy of Mahatma Gandhi. On 2 October 2016, Borderless Gandhi Project will open the exhibition “Mahatma in me” by Delhi based artist Vibhor Sogani. This will consist of stainless steel sculptures installed at the Barrack Street Jetty. The exhibition focuses on the inward qualities of each individual, provoking self-realisation through reflection. Yesterday was the media launch in Perth for Borderless Gandhi and Confluence Festival. Here are a few pictures from the night. For more information about Confluence and the events held in Perth to celebrate Indian culture, visit the Confluence website. For more information about Borderless Gandhi, visit the Borderless Gandhi website.